"Learning about the different types of eclipses, because I never bothered to learn the difference between the different types of eclipses." "Learning about the penumbra and the umbra. I had no idea they named different types of shadows (although I'm not surprised!)." "Solar eclipses are so cool because of how the sun, moon, and earth are all lined up at once. Anything about the moon so cool to me though." "Learning about solar eclipses, mainly because we just got the chance to see one this past summer. I understood the general concepts, but getting to see what specifically made the opportunity to see one last year is so much more wonderful." "The timing of the moon's orbit and phases--I didn't know that the moon's orbit tilted like that, and that's why there isn't always an eclipse every new or full moon." "The reasons why we do not see a solar or lunar eclipse each full moon or new moon. Also, that astronomers can predict when the next eclipse will occur." "How lunar and solar eclipses are more common than I previously thought." "That ancient astronomers centered Earth rather than the sun, and aligned that with their religious beliefs." "How ancient astronomers figured out things about motions in the sky simply by looking--whether true today or false--without our technology. " "It must have been horrible to think that you could have the death penalty just for questioning Ptlolemys model of Aristotle. What other people had good input or suggestions? They couldn’t speak up because of fear." "The difference between an umbra and penumbra." "All of the new terms and concepts: penumbra, umbra, lunar and solar eclipses. VERY confusing." "I really don't get the solar eclipse concepts. I knew what I thought was correct but after reading the book, I just got confused. Please go over that." "How to identify whether a lunar eclipse is about to happen when looking at the (nearly) full moon." "I'm having a hard time wrapping my mind around how to consistently determine what phase the moon is in during solar eclipses vs. lunar eclipses." "I seemed to get myself a little jumbled up about the different terms for eclipses. I think I just need a run down in class to get it straightened out." "Personally, I'm confused about predicting eclipses and knowing how everything lines up. That doesn’t make sense to me." "The idea of 'scientists' versus 'non-scientists' is slightly confusing to me because I traditionally viewed them all as scientists." "The epicycles in Ptolemy's model. Luckily that's not actually how things work." "I did sort-of believe that things said about astrology could be true. However, after finding out that my sign actually isn't my sign made me rethink the time I have spent reading my horoscope. Maybe my new sign will be even more accurate." "I have learned that astronomy is completely different then what I expected. I learned there is so much more information regarding horoscopes and other ideals given by astronomers. I do agree it is a little weird to think about the different cycles being able to control your future, which is why I disagree." "I have never believed in astrology, and I still do not believe in it, but I do think it is entertaining to read such detailed predictions about certain astrological signs. I love to pretend that it is real." "What I know now about astrology does not change my disbelief in astrology. I believe that the starwheel reveals which stars are in place around my birthday but it doesn't do anything more for me like tells my future or anything." "I'm a little upset my sign is technically wrong. But it's cool to know that the predictions could still be right." "I think that it maybe makes some sense that my horoscope almost never matched, but I'm still not a big fan of astrology." "I AM A COMPLETELY DIFFERENT SIGN. before this class I thought I was a capricorn and had always read that horoscope and never questioned it (although I never really related) then after I looked on the star wheel I realized I am actually a Sagittarius. Before, I never identified with my horoscope leading me to not believe in it but now that I've read and really identified with another sign, I really like the advice it gives me and the characteristics are dead-on. My mom also discovered that she is a different sign too!" "I learned that because of precession, the sun doesn't line up with the right zodiac signs." "I had heard that the signs were wrong or flipped a long time ago but I did not believe them." "I still don't think that stars and stuff can really affect anything or predict anything in my life." "I knew that the sign in the stars could tell your future in your horoscope. At times I would like to believe in it." "I have a better understanding on how people are able to know where constellations are during the daytime." "I personally don't feel that my existence affects the stars existence, so therefor they do not have the ability to make predictions about my future." "Knowing that zodiac signs do not correspond with which constellation the sun is actually aligned with definitely creates some doubt around the whole thing." "I don't think that the date and time we were born has anything to do with the people we become or the things we go through. I think it's too vague and too general so people automatically feel as though they can relate." "The sun aligns with the signs each month. Over time, because of Earth's tilt, these constellations move little by little and eventually a new constellation will align. Therefore, predictions based on the old sun alignments will be one month off rendering all horoscopes useless. I'm also not superstitious and believe everyone has complete control over their life." "Because of precession, the sun signs (or astrological constellations blocked out by the sun during certain months) will gradually begin to change. The original established time frames that dictate sun signs have therefore changed over centuries, making most people's signs something new. Astrology is a sham!" "I have the same belief that astrology does not predict my future. It's still super-fun. I find it interesting that the sun signs are different due to the slowly changing sky." "I learned no new information on astrology, as I have rallied against it since I was able to comprehend astronomy as early as sixth grade." "I did not know that popular horoscopes decides our astrological sign based off of what the Greeks saw in the sky and how that has since changed. I thought I was a Cancer, but I guess I am actually a Gemini. I definitely relate to a Cancer though so I am going to pretend that I am." "I did not know that the stars have since shifted so far that each sign would technically be considered to be a different astrological sign. This does not change my thinking though, since I still believe that people have more free will than for their personalities to be predicted through the stars." "I did not know that the precession of Earth affected where the zodiac constellations would be over time therefore altering what we've been told about our birth signs. This did affect my earlier opinion from disagree to a strongly disagree. I mean come on, the OG way is cool but I'd rather know what the sky actually looked like on the day of my birth." "I believe in astrology. However I do not believe that the alignment of certain stars can and will predict my future. They can predict eclipses and seasonal changes but not my future. But the zodiac constellations and signs have been around for ages. I think they do have some sort of significance to us as humans born under a certain sign and a significance to the space beyond our knowledge.I didn't know that my sign would be different according to the sun signs." "I previously thought that astrology was all false, and even now, after reading about pseudoscience and how it has been proven that there is no connection between the sun, moon and people's personalities, I still find myself reading my daily horoscope and falling for the words I'm reading. Guess that goes to show that pseudoscience really is a stranger to logic." "The knowledge I obtained has not changed my belief, however I did find it interesting that our zodiac signs are now incorrect due to precession." "I think it's pretty cool that our actual astrological signs are different that what are commonly considered and thought to be true." "Do to precession the basis of astrology seem to be even more shaky then I thought which helps me to maintain my disagreement with astrology." "When previously asked to describe to what extent I believed astrology could be capable of making accurate predictions about my future I marked 'disagree' and am now marking my answer as strongly disagree' simply because in-class discussion only strengthened my disbelief in the power of astrology as a predictor of the future." "I had no clue where the signs came from. It is really cool seeing that astrology is real, despite not believing they can predict my future." "Even though we learned that the astrology signs are off according to the actual sun sign, I still do not believe that astrology can predict someones future because I believe people have their own free choices in life." "I am kind of confused on the phases of the moon during the eclipse types, could you go over them?" "How can I tell when the moon has the right or wrong phase and wrong or right orbit for an eclipse to happen?" "I could not find the phases of the moon during the different eclipses in the textbook." "This is some complex, tough stuff!" "I am hoping I do well on this quiz on Wednesday, P-dog." "I really enjoy your teaching style and your attitude, and the website is awesome. My other online classes are nowhere near as organized. Thank you for your dedication to be a great instructor, it shows." "You seem just as much interested in the way people learn, as you are in teaching astronomy/physics." "Everything astrology says is a lie and I love it." The following questions were asked on reading textbook chapters and previewing presentations on lenses. "How to do ray tracings, but not sure what they are illustrating." "I learned how to trace the light rays through each type of lens. I didn't understand it in class where the third line was supposed to go but I got it now." 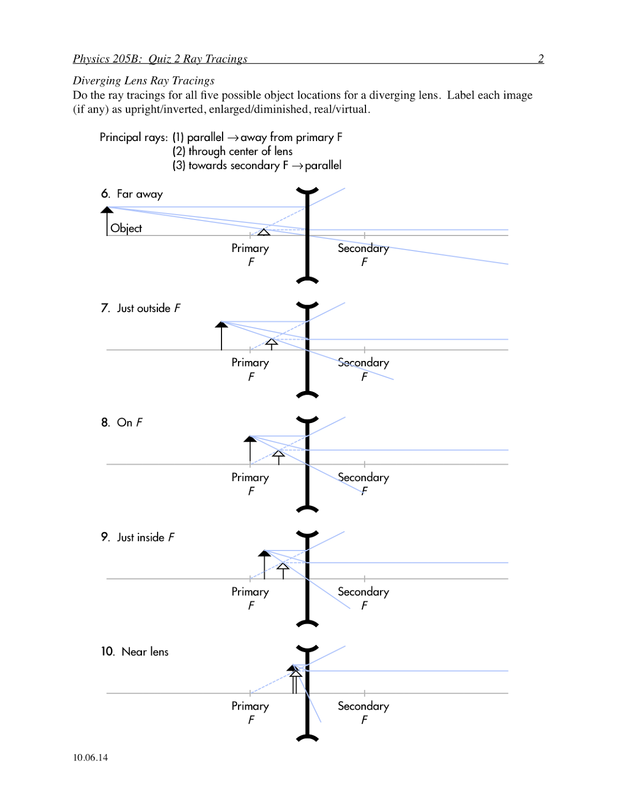 "I understand the basics of diverging lens ray diagrams. I feel like I can successfully start to attempt these problems." "I get that converging lenses take parallel rays of light and bring them to a focus at a point in space whereas diverging lenses take parallel rays of light, de-focuses them, and projects them outward away from a point that, when traced, ends up being in FRONT of the lens. The points (F) are FOCAL points. A real image occurs when rays of light intersect at a point in space (converging lenses). A virtual image occurs when rays do NOT intersect and move outward from an extrapolated location." 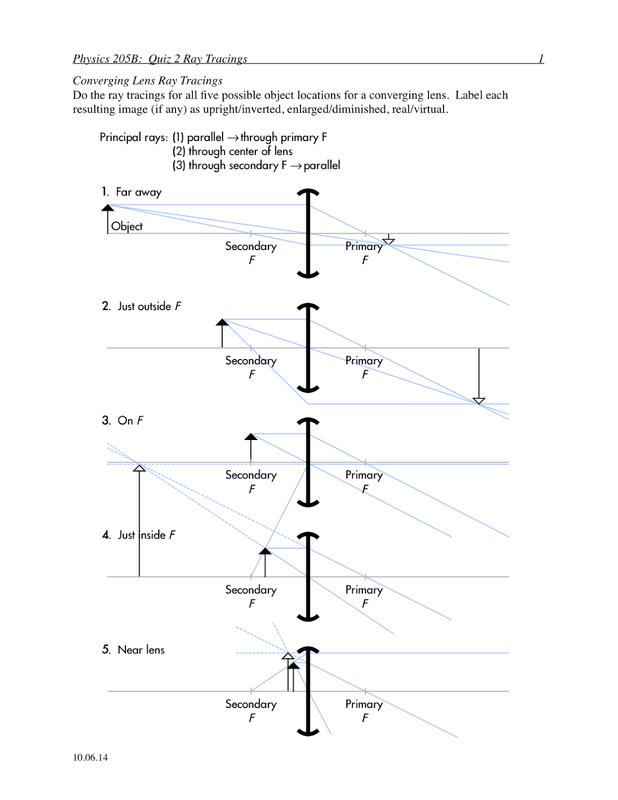 "Converging lenses causes incident parallel rays to converge at the focal point. Diverging lens causes incident parallel rays to diverge after exiting the lens. Diverging lens always forms a virtual image that is on the same side of the lens as the object and is upright and smaller relative to the object." "A diverging lens will create a virtual image that is upright and smaller that the original." "Lenses create images by refracting light through the lenses surfaces. Two different kinds of lenses manipulate light by either focusing beams or 'defocusing' beams of light to create an image." "I understand that if the redirected rays of light intersect at a location beyond the lens, then the object is portraying a real image. I also understand if there is a lack of intersection beyond the lens among the redirected light rays then the image is a virtual image." "I understand that I will have to study physics more than I am right now." "I keep reading the presentation over and over again but can't figure out what the difference between real and virtual." "I have go through it thoroughly yet but it is difficult to understand the way to draw a graph to find the image for a diverging lens." "I found the ray diagrams to be a bit confusing at first but it is making much more sense now." "I'm not quite sure when drawing ray diagrams whether a virtual or real image occurs. Are virtual images before the lens and real images after the lens? Some quick clarification would go a long way." "I am still a little bit confused on virtual images vs real images. I'm not sure which is considered virtual or real when looking at the examples that we have on the reading assignment." "Whether an image is real/virtual, upright/inverted, or enlarged/diminished was very confusing. The book and presentations weren't super helpful, perhaps I missed something!" "I found converging lenses more confusing. 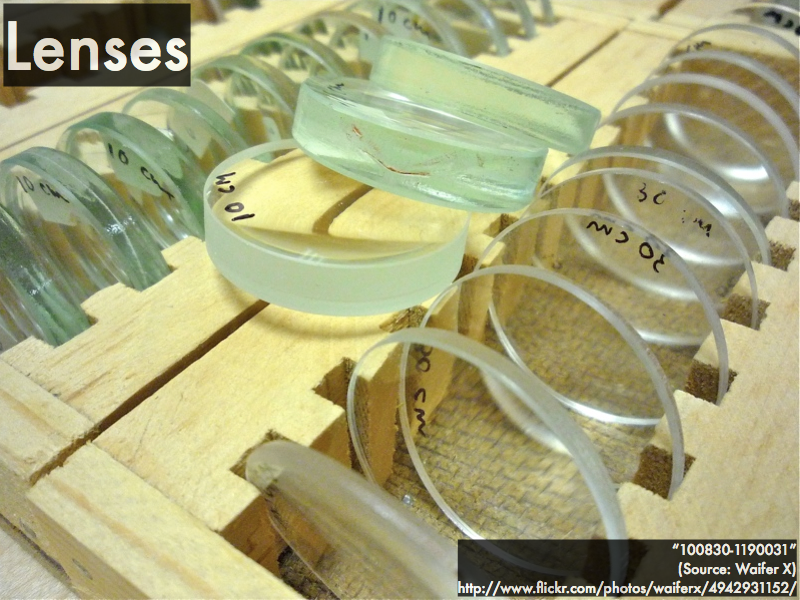 I feel like they are much different from diverging lenses and would appreciate an introduction to these." "I'm really confused on what a real and virtual image is. I see the definitions but I do not understand what they mean or look like." "When is an image real or virtual? How do we determine image orientation? Those are the most confusing parts for me." "That you have to be in specific areas on Earth to see a total solar eclipse because if you aren't in that area you will see a partial eclipse or won't see it at all." "Ever since I was a kid I wanted to see a lunar eclipse. I just always thought that they were the coolest thing, and learning more about it and how it happens really interests me." "Eclipses are not commonplace phenomena." "Eclipses happen more often than I thought." "That people had thought Earth was the center of the universe." "How these early astronomers thought, and how they crafted their hypotheses with the little data that they had." "I didn't know a solar eclipse happens when the MOON goes in front of the sun." "The penumbra and umbra confused me a lot." "The different types of eclipse are hard to remember." "When talking about the phases of the moon in relation to eclipse it was hard to understand if the moon phases had to stay the same in order to have a partial eclipse. For example in the case of a partial lunar eclipse, when I was reading the text it wasn't clear for me as to what phase the moon was in, was it still a full moon?" "Annular or partial eclipses. I didn't see how to tell if it would be classified as either of these. Would it need to cover a certain amount of the object or would it matter if it was just touching it at all?" "The retrograde motion of planets, and parallax. I just felt like I'm not quite grasping their concepts and how to apply them in class." "The models created by the astronomers kind of confusing (epicycles? what?). The illustrations in the book didn't quite cut it for me." "I found the history of astronomers confusing only because it is not as interesting for me." "I know now that some of the horoscopes are about a month off from what the starwheel says." "The signs differing from the star wheel from what is commonly accepted makes me want to criticize astrology more. It further confirms my belief people will apply generalized aspects to themselves." "Nothing has changed in my opinion of astrology. But I feel better informed on how todays Sun signs are no longer in correlation to previous sun signs due to precession." "I find it cool how the different astrology signs align with the months, but I still don't think it can predict my future. It is too vague." "I didn't know that precession really had that big of an effect on astrology but know that I do I can honestly say that it even furthers my disagreement with astrology. The changing north stars really changes my perspective on the stars around me, and has me asking a lot of questions." "I still believe and will always believe in astrology, no matter how science proves it wrong." "Confused about the astronomers but I didn't spend that much time reading it." "Still loving this class! Thank you P-dog." "I really enjoyed this section, but I'm hoping that during class we can go over it a lot more." "I'll buy the book soon, I swear." The following questions were asked on re-reading textbook chapters and reviewing presentations on polarization. "Polarization has been easier to understand from the presentation and in class activities. Based on the way the antenna or whatever transmission device is facing, polarization will occur neither above or below, but alongside it." "In all honesty I found this material unclear without an instructor's explanation. Extra help and clarification is needed." "The lesson was pretty easy to understand regarding the function of antennas and their waves. The use of vertical and horizontal antennas have different uses such as for airplanes or old fashion televisions." "The fence model example to describe polarization is VERY helpful. Makes the concept easy to imagine/see." "Only about half of the original intensity of unpolarized light is able to pass through a polarizer. Meanwhile the remaining light is vertically polarized with another half of polarized light." "Light polarization can be studied through interaction between antennae and polarizers. Light emitting from a glowing phenomenon, like molten lava, is unpolarized--oscillating in all directions, whereas an antenna is polarized (vertical waves). 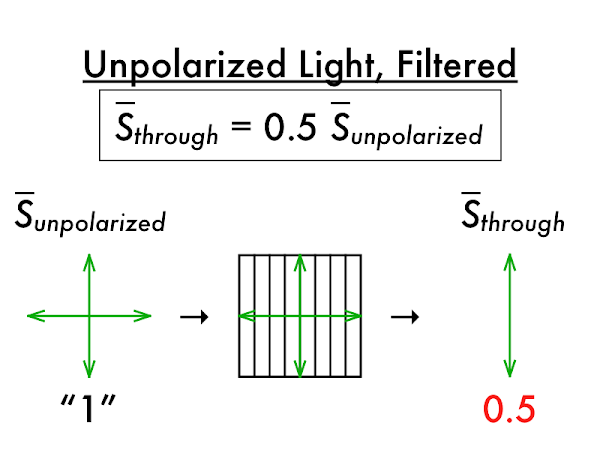 Incident light polarization can be calculated by the angular orientation of the polarizer. A polarizer set perpendicular to the wave will have a transmission of zero, as cosine2(90°) is zero. Incident light from a vertical antenna passing through a vertically-oriented polarizer will have essentially full transmission (cosine2(0°))." "The introduction to polarization in general terms. I understand antennas much better as far as knowing what direction they should be for signal reception." "Polarization is confusing in my opinion. I feel with some extra explanation I'll understand." "Malus' law is confusing. Especially when the transmission axis polarizer is at arbitrary angle to the polarization of incident light." "Thinking through the specific polarization(s) of light that would be blocked." "I feel as though I understand most of this material. But I could use some better explanation on how the angle of unpolarized light going through a polarized surface, how you are able to calculate the amount of light making it through." "I had a little more difficulty understanding the fencepost model. Specifically the relationship between the direction of light and the fenceposts." 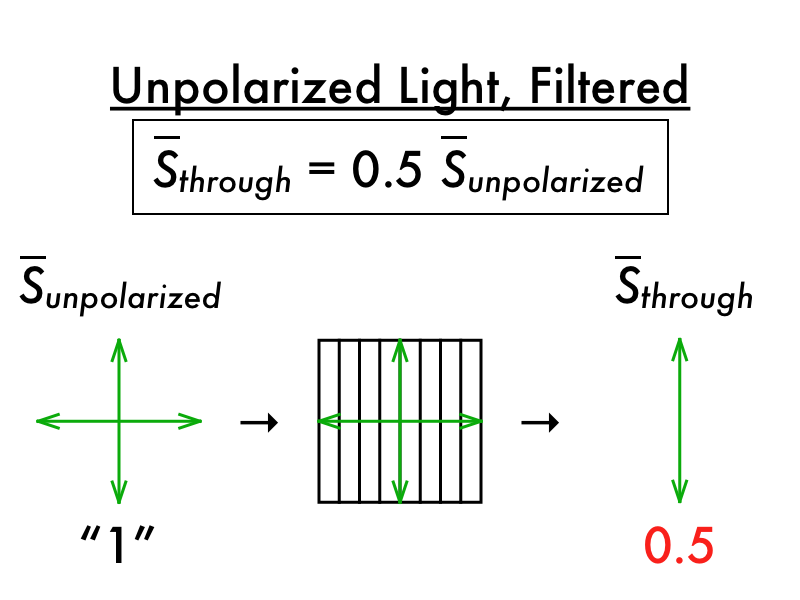 How much unpolarized light is transmitted through an ideal polarizer? Unpolarized light shines through two ideal polarizing sheets, that have their transmission axes aligned at right angles to each other. How much of the original intensity is transmitted through these two sheets? Unpolarized light is projected through the first (smaller) polarizer. If the transmission axis of this first polarizer is horizontal, then one-half of the unpolarized light will pass through, and the light that passes through is now horizontally polarized. Polarizing sunglasses are typically manufactured with a vertical transmission axis (to filter out horizontally polarized glare while fishing or driving). Consider a Nexus 4 smartphone (again, held in portrait mode), and polarizing sunglasses (with a vertical transmission axis). "Not sure I understand when light passes through the first polarizer and get blocked by the second one." "I'm good as long as we go over polarizers in detail." "Could you go over Malus' law and the last part of the polarization section of the presentation preview?" "Coming to office hours when I am too confused really helps." "I am really glad that you are instructing our lab sessions. I feel much more secure in class." Astronomy current events question: habitable planet around pulsars? Recent observations of KIC 8462852 ("Tabby's Star") funded by __________ determined that the dips in its brightness is mostly likely not due to an alien megastructure. (E) an international research consortium. The following questions were asked on reading textbook chapters and previewing presentations on Earth's rotation/precession/revolution/tilt, the moon's motions and cycles, and watching two video presentations on the flipped class: "What Is the Flipped Class?" and "How the Flipped Classroom Works." "I found the terms for the moon very interesting. I have only been familiar with terms like full moon and new moon, but getting to know more professional terms such as waxing and waning and etc. was very interesting." "The way that humans have come to correlate the full rotations and revolutions of the earth and moon with fixed time spans, such as a month or a year." "I think one thing I found interesting was the graphic demonstrating the orientation of constellations during the day. For some reason, I'd never thought about the obvious reality that even when they're blocked out by our own sun, we would still be directly underneath a set of constellations. Seeing that graphic and reading that concept explained really made me realize how much I really had viewed astronomy through the lens of night time stargazing." "I thought it was interesting that revolution and rotation are described as two different things. When I thought they meant the same thing, one is actually just the turning of the planet while the other is the motion of the planet around something else." "I found it extremely interesting that because of precession our earths axis changes every 26,000 years! changing what we see in the sky! and that in about 12,000 years our axis will be facing Vega which is a super bright star!" "What causes an equinox and a solstice, I have heard people talk about these for along time but never understood what they were until now. It feels nice to leave this lecture knowing something that I am always hearing about but have never quite understood." "The organizations of zodiac signs, I never realized their importance with relation to their position to the sun." "I'm weirdly obsessed with the moon, so reading all about the moon and its phases, as well as fun facts like the moon always facing the same side toward Earth, was interesting! I've also always been sort of unclear about moon terminology, so reviewing the slides helped a lot with that." "Phases of the moon. I have always loved looking up at the moon and learning the proper way to identify the phases was cool to me." "The sun's paths. I liked the illustration on the first series of slides that showed the path of the sun over a year, and how it changed." "That the word 'month' came from the word 'moon. due to the phases taking the approximate time that a month is. I found this interesting because I love history and the reasons words are formed. I learned Month and Moon are cognates and cognates are words that have etymological origins meaning they are directly related. I love falling down the rabbit hole of learning!" "I never really know the reason for the seasons and assumed it had something to do with our proximity to the sun, however I was fascinated to learn that the reason for them was the amount of solar energy the hemisphere receives at points of time." "For me, one of the most interesting things about the presentation previews was the information provided concerning precession. While reading the descriptions of the Earth’s motion as a 'toplike' in the textbook, I was struck by just how significant the motions and cycles of the Earth really are. In addition, to consider the fact that it takes an approximate 26,000 years to complete one precession cycle is astounding, and it really puts into contexts just how young mankind really is." "I found it interesting that the 'north star' changes depends on how Earth is tilting. I didn't realize that the north star changes and that it is possible at some point there will be no north star." "Pole wandering. The idea that because of tilt of Earth the placement of constellation change needed prior understanding of basic concepts, and therefore it took me a while to understand that the because of Earth's tilt, the position of north constantly changes and the angle of the constellation changes respect to Earth." "How the moon rises and sets at different times of day, patterns of the moon." "I think that the presentation did a much better job explaining the celestial motions than the textbook did, but I still find the lunar cycles a bit confusing. I'm pretty solid on the major phases and the waxing, waning differentiation, but the quarters are really confusing to me still. That, and maybe after looking through the quiz preparation guide, more star chart practice could be really helpful topics to discuss in class." "Figuring out how exactly the Sun travels in different paths across the sky throughout the year based on the tilt and revolution of Earth is a bit confusing. The graphic in the presentation helped, and I understand the concept of it, it's just hard to picture being on Earth and realizing how the Earth must be tilted at a certain angle because the sun is in a certain path of the sky." "How the tilt of Earth is what causes the seasons and not how close we are to the sun. I always thought that how close we are to the sun is what caused the seasons, which might be the reason for my confusion. I understand that Earth tilts and is getting more sunlight on one of the hemispheres but does the hemisphere that is getting less sunlight experience winter while the other experiences summer or are the both in summer when the northern hemisphere is exposed to more sunlight." "I have not read the book or any materials yet. However I did enjoy the material on the first day of class. It kept me engaged and ready to learn about the stars and how to use my star wheel. Although I do need to practice that a bit more..."
"Although very interesting, I found the phases of the moon to be a bit confusing. There seems to be a lot involved and several steps, I look forward to learning more about this." "I alway get confused with waxing and waning, I have learned it before but it just never sticks. Same with crescent and gibbous." "I am not confused yet...or I think I get it and just haven't realized that I am confused. This first chunk of information was fairly easy to digest." "I had a hard time grasping the concept of precession especially that the north star will change and or be non existent. It may be because my mind cannot grasp the 26,000 years it takes the Earth to make a complete precession." "There seem to be a lot of rotations and revolutions for Earth, the moon, and the sun. I find it hard to visualize what this all looks like." Match these cycles with their approximate duration. "My disbelief in astrology is based on my belief that human beings are unrestricted in their thoughts and actions by any form of fate. In my opinion, to suggest that astrology is capable of making accurate predictions about the future is suggests that there is a fixed or fated future in existence, which contrasts my personal thoughts concerning the free will of all humans to create for themselves their own future. Rather than a legitimate method with which to make predictions about the future, I view astrology as no more than a system of thinking that is more of a pseudoscience than anything else. However, I do believe that if believing in astrology inspires in others a sense of joy or inspiration to live fuller and more productive lives than it can serve a positive purpose." "I enjoy reading my horoscope every now and then." "I believe you are not one set zodiac sign, because personally, I relate to almost all of them on some level. But I feel like I connect with one the most, which is Gemini, my zodiac sign (what it says it is). I do feel like the predictions people make can be out there, but most of the time they are oddly right (when I read them after my day, so there is no conformation bias)." "I do not think that it can make predictions about our future because I believe in free will, that we as people choice our own destiny and it is not laid out for us." "I do not believe that stars can predict anything. I am Christian, and I think that is a myth." "I cannot say for certain whether or not astrology has any real value. I have found striking councedences when reading predictions about my sign but this is probably just the placebo effect." "I don't believe celestial bodies can accurately predict the course of real-life events." "Basically I don’t look to astrology for predictions of my future, but I have to recognize that sometimes when looking at them they are correct after-the-fact." "I don't believe that the stars can tell me about my future. I believe that my existence is not important to the stars or their alignments, so why should I think that they know about my future?" "I personally think its really fun to look at horoscopes and sometimes they are supriseingly accurate on some of my friends personalities but I disagree because there is no proof that it is true." "I do not believe in astrology because, as the book states, it is based off of nothing but pseudoscience. My sister was really interested in astrology when we were kids but the fact that what the astrology predictions said was not always correct had me in disbelief." "I don't believe that astrology is that accurate. Anyone can relate to any of the signs at some point or another." "I think that it may be accurate with some parts of my life but I do not think that it can predict what will happen to me. I believe that I have almost full control over my future." "I think that the decisions you make today will affect your future." "It can be accurate, but I think this has more to do with vague guesswork." "I believe in astrology but not that it can predict my future." "I am spiritual, but science will always hold a candle above any other beliefs I may have. I do not judge people on their beliefs as long as they are not hurting anyone." "I do have firm beliefs that astrological signs may explain our future's and past. I'm neutral because im not 100% sure that something like an astrological sign has an impact on a person and their decisions." "I believe this takes away from the free will God has given us." "Astrology is just vague, blanket descriptions that could be applied to anyone. Mercury being in retrograde does not cause people to be jerks. Personality does." "I am a huge astrology buff, I revolve my life around the zodiac signs and reading my horoscope. Not that it necessarily tells my future but can help ease some stress when when wondering why certain events occur in my life." "Astrology is the poster child of pseudoscience. There is no reason to belief that the coincidences such as birthdays and star placement in the sky affect anything about a person." "I am a Cancer, and I feel as though my astrological description is very accurate to who I am. Also something I find fascinating is that (for the most part) a lot of my closest friends and people who I connect with more are either Geminis or Leos!" "It is not a real science. I can see where its value over history has grown and created comfort to those who longed to understand. However it is still not proven to be effective." Place these moon phases in chronological order in their cycle (starting with new moon). Explain what is different about homework in a flipped class. "I love the idea of flipped classroom. I like how the materials are put online so if I have to take a sick day, I can still catch up to all the materials without hassle. I really like how students get to spend class time with interactive activities that will make the course more engaging. Conventional class you will sit in a class and listen to the teacher's lesson." "In a flipped classroom there is more time devoted to preparing for class by going over key concepts and lecture notes, while time in class is spent clarifying ideas and working face to face with the instructor or in a group to understand the material." "In a flipped classroom homework isn't just to test your understanding of the lesson, it is the lesson. You're expected to engage with the professor's lecture and presentation of the weeks topic in advance, so that class time can be better spent increasing your understanding of the subject rather than introducing it to you for the first time." "In a flipped class, the homework is based on or exactly what the instructor would have taught the following class meeting. This means that students have more time to be hands on during class, while instructors have more time to give feedback. A conventional class would consist of the instructor lecturing about the something that was more or less in the homework. This gives the students and instructor less time for hands on activities in class." "I like the flipped classroom idea a lot. I like it better because I'm not rushing my notes and listening to the teacher to make sure I have good notes. Instead, I can take notes on the presentation and then read it again to review and make sure that I can fully grasp everything. I love love the hands on approaches. I think I get things better that way." "The teacher gives us the material before class so we can go over it. If we have any questions then we ask the teacher. This provides the teacher to spend more time on topics that are a little more difficult to understand." "A major difference in a flipped classroom versus a traditional one is the way that the students do their work. In a flipped classroom often times students take their work outside of the classroom and review on their own. A traditional classroom tends to have a teacher lecturing while students take notes." "I think it is a rad idea. Our school system is super outdated and needs to change. I think for student who are stoked about learning this would be great. However, for students who want to slack, this seems like a good reason not to go to class." "The homework is really a preview of the next class in a flipped class setting." "Homework in a flipped classroom is often done in class as a class activity, not at home. Traditionally homework is something that is mowed over at home on your own, but in this "flipped" classroom the process is reversed." "In a flipped class the homework is done in the classroom as opposed to doing all of it outside of the classroom. This help students because if they need help they can ask the teacher or get help from their peers." Describe where/when most student learning occurs in a flipped class. "I think most of the learning time is spent outside of the classroom, whereas in the classroom you get a better understanding and get any questions you may have answered so that you leave feeling prepared for any homework or assignments following." "Most initial student learning should occur during a class applying the knowledge they have gathered when reviewing the lecture." "Students should learn when practicing their work in class with the teacher's help when they walk around and can be one-on-one with them and work through the examples and problems." "You should get most of your learning done in class where you are given the chance to ask more questions and get more help." "Student learning, in a flipped class setting, should take place at home, where the student can take their own pace processing the the learning material, readying questions for the professor, and not stressing over confusion or solitude that comes with conventional homework (which, in the flipped setting, will be completed in class)." "The most learning is done on their own time at home. The students will come to class ready with questions to discuss to become better equip with the knowledge about the subject." "Depends how you define learning. I think the information should be presented before hand, that way the discussion can be better during class." "Most student learning is being done on their own, using how they learn at home. Then if they have questions on any topic, they can ask and get a better understanding while in class. In class, they are applying their knowledge they learned." "I think that things will really start to click in a flipped class because after viewing the material once, the seed has already been planted. It is like going to class is watering the seed and really making sure that we understand it by the second time around." Pick one piece of student advice from the previous semester, and discuss why you agree (or disagree) with it. "'Before each quiz do the quiz question packets--that is the best way to study for the quizzes, and also go to all of the classes. P-dog does really well at explaining everything.' I agree with this piece of advice because working with any form of study guide has always served as an excellent study method for me in the past. It often isn't enough for me to simply read or hear about facts to truly have them solidify in my memory. Rather, having a strict study schedule that focuses on past quizzes and exams and study guides usually allows me to fully grasp the key pieces of information required to do well in a course." "'Stay on top of the assignments and if anything seems confusing, like how much the website/blog is used, or the format of the practice quizzes, contact P-dog right away. He is there to help! He obviously enjoys teaching, that's refreshing. But if you get confusing about using the website/blog, ask, don't wait! (I'm still trying to decipher it all!)' I strongly agree with this piece of advise and know that the assignments are definitely something I put off until the last minute, and when you do that it is hard to find the time to ask questions about the things that you do not understand. I think that many students have a similar problem to mine, we like to put things off until the very last moment but that just won't work in a classroom like this." "'Ask questions.' I agree that by asking questions it will make mea more successful student and make this class easier to pass. I feel that by getting all the I formation I need to fully understand what I'm reading or having the teacher clarify a concept better will lead me to the path of success. So if I'm ever confused I will always ask questions." "'Go to class!'" Simple and to the point, and the first thing I thought to myself as I was sitting in class the first day. The group work assigned during class will not only help solidify the material, but will also give me needed points. It will be the best thing,for me personally, to do to ensure my success." "'Go to class! And don't be afraid to use the online resources. The quiz and test archives are there to help you succeed.' This seems to have more weight to me. From what I've observed so far, that as much as P-dawg will cover in class, there will be material to be covered at home on my own time. I must utilize my tools and readily available resources in order to be the most successful in this course." "'Do not procrastinate. Do not give up. Every point you can gain is worth it. Whether you've maxed out your points and are using it as practice, or you're actually getting points for your final grade, don't waste any opportunity.' I like this quote because it's not just for this class, it's for every class I have and will have." "'You need to actually study and do the reading assignments.' This is what I struggle with, especially with motivation, and I strongly agree with this statement." "'Don't get caught up in all the various subjects. Eat this thing one bite at a time.' I agree we this method because it is easy to get overwhelmed by what's happening with the rest of life." "'Don't die.' I agree with this because as long as you put in effort, even if you're bad at the subject--you're still participating and trying." "'Come to class, do these assignments, and try (but fail no matter how hard you try) to grow a better mustache than P-dog.' I agree with this one, but I think the reasoning really speaks for itself here. I mean, come on, the mustache can't be topped... But seriously, the first two points are really good advice. I think that as I understand the class so far, attendance and participation in the class work both in person and online are going to be crucial elements of my success or failure in this class." "I have never learned in a flipped classroom, but have always been interested in the concept. Looking forward to experiencing this change of pace from regular lecture classes." "I have never experienced a flipped classroom setting before, but the information you have shared regarding the benefits this form of learning enviornment can have are very interesting to me. Thus far I enjoy having the opportunity to become familiar with course topics prior to attending lecture, as it allows me a chance to identify concepts that may serve as challenging to me prior to setting foot in the classroom. I look forward to seeing how this method of teaching impacts my learning style." "I'm always so tempted to @ you on Twitter :p"